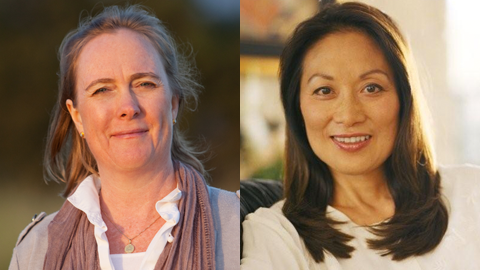 The Santa Barbara chapter of the Association for Women in Communications will once again honor two local women who excel in the communications realm on Wednesday, June 3. This year’s theme “Pioneers for Change: Communication, Community, Choice” fits the two honorees to a tee. Sigrid Wright manages the annual Earth Day Festival for the Community Environmental Council. Marilyn Tam wrote the internationally acclaimed book The Happiness Choice. Both of these environmentally minded women began their lives in this country in Eugene, Oregon. Wright, a fifth generation Oregonian, earned a degree in journalism from the University of Oregon. Tam arrived in the United States from China when she took early acceptance to that very university half way through tenth grade. She later transferred to Oregon State University. Wright went on to receive her master’s in Communications Design from the University of Baltimore. First thing upon her return to Eugene after graduation, she went skydiving. This marked a turning point for her. “My life feels like I’m strapped to a rocket ship,” Wright said. Last summer she escaped her email inbox by traveling to Arctic National Wildlife Refuge in the Brooks Range of Alaska. Wright used this trip as her way to celebrate the fiftieth anniversary of the Wilderness Act, which protects areas where people visit but don’t remain. The day after her arrival home from this place so far off the grid none of her gadgets worked she strapped the rocket ship back on to present at a conference with 5,000 attendees. Like Wright, Tam uses speaking opportunities to leverage change for the most number of people possible. Recently Tam spoke to a crowd of 6,000. “Those 6,000 influencers are each going to talk to their 6,000 and then I really have a multiplying effect,” Tam said. Tam once went on her own pilgrimage to the ends of the earth. On the plane ride to the country of Bhutan Tam met the Minister of Home and Culture. She ended up working with government officials to transition the country into the 21st Century. Before television came to Bhutan WWF stood for World Wildlife Federation, within one year after TV arrived the country recognized the acronym as standing for World Wrestling Federation. “That is how fast change happened,” Tam said. Because of Tam’s efforts Bhutan retained their cultural and environmental heritage, and became a completely organic country. A luncheon will proceed the awards on Wednesday, June 3 at the Santa Barbara Women’s Club in Mission Canyon. Registration begins at 11 AM. AWC-SB welcomes nonmembers to attend at a cost of $65. The price for AWC-SB members is $55. Those who want an opportunity to join like-minded individuals at the luncheon may become a Green Choice Sponsor or a Happy Choice Sponsor for $95. Organizations and individuals interested in sponsoring the event should contact Lynn K Jones at lynn@lynnkjones.com or call 805-448-7681. Many people enjoy the part of the luncheon where AWC-SB Poet Laureate Perie Longo, a past Woman of Achievement, reads poems she crafts for the honorees. Other previous recipients include Dr. Nancy Leffert, Marianne Partridge, Marsha Bailey, Paula Lopez, Lynda Weinman, Starshine Roshell, Catherine Remak, and Melinda Burns. This entry was posted in Past Events on April 7, 2015 by Lisa.